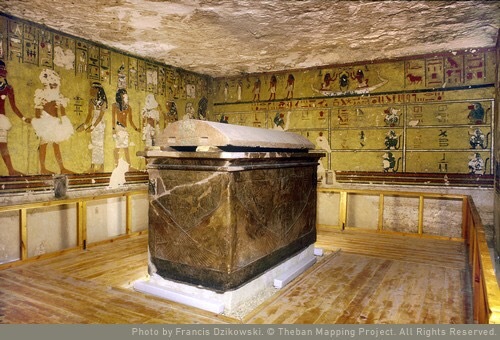 View of the burial chamber of KV23 (Source: Theban Mapping Project). KV23 is the Theban tomb of Ay, the penultimate pharaoh of the Eighteenth Dynasty. Ay rose to prominence under Akhenaten and was permitted to build himself a tomb at Amarna. By this stage, he had risen to the very high rank of ‘Overseer of all of the horses of his Majesty’. He rose again to become Chief Vizier under Tutankhamun and acted as his advisor along with the General Horemheb. When Tutankhamun died without an heir, Ay took advantage of the power vacuum and quickly assumed the throne. 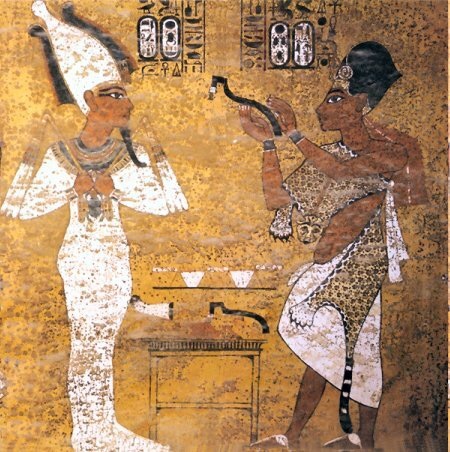 Scene from Tutankhamun’s tomb depicting Ay performing the Opening of the Mouth ceremony for Tutankhamun (Source: Wikipedia). NEWS: New excavations in the Valley of the Kings. The pots and pans of classical Athens illustrate the contrast between the materials used in ancient households and in our own; they also show the care taken by the ancients in making the ordinary utensils for everyday needs. These two particulars , contrast in material and care in execution, stem from the same root: in ancient times domestic equipment was a product of the potter’s craft . 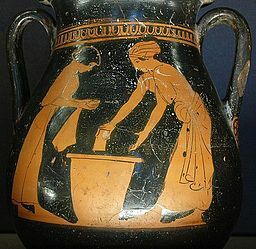 Modern housewives have other materials at their service-such as steel, aluminum, the Athenian housewife depended on utensils made of clay, either turned on the wheel or built up by hand, and fired in a simple kiln. 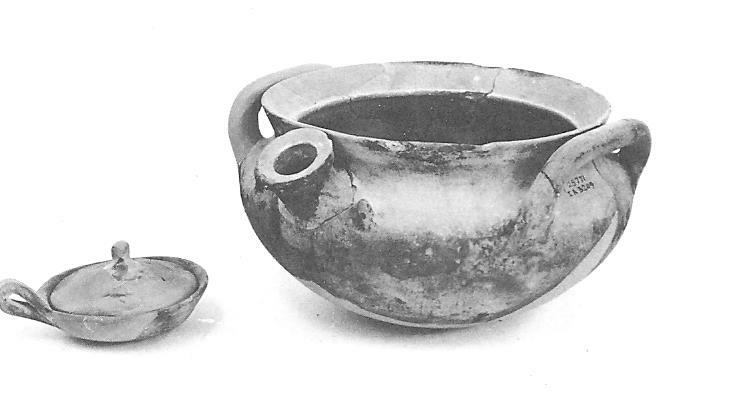 This equipment included both tableware, fired to produce that shining black glaze which was the pride of the Athenian potters, and the unglazed or partly glazed kitchen and storage pots- saucepans,ovens, frying pans, stoves, casseroles, braziers. 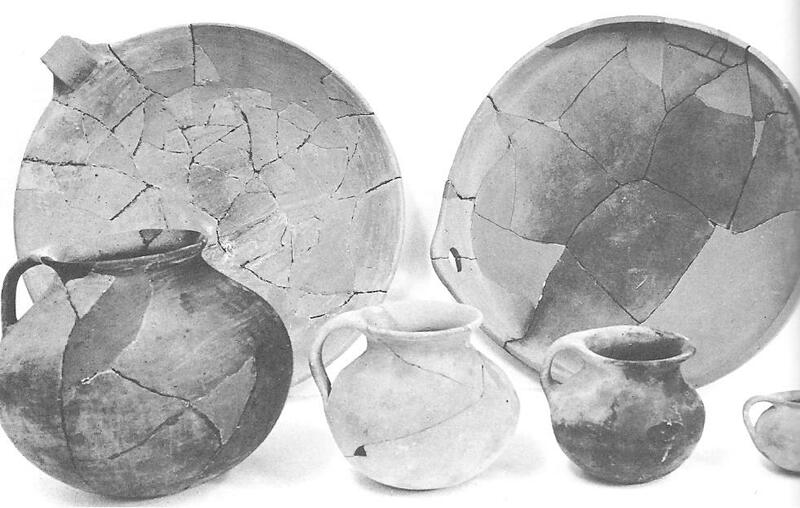 Even bath-tubs and other toilet fixtures, water pipes, pails and light fittings in classical times were made of pottery. The rivalry of potters was widely known; the range of shapes shows how the demand for skill and ingenuity was answered. Moreover metal was expensive, clay cheap. The householder who might own a single metal pail would possess two dozen or more clay vessels. Further evidence on objects of daily use, and in some cases for the names of household shapes, comes from Athenian literature especially from the comic poets of the fifth and fourth centuries B.C.. Intimate domestic detail, together with domestic disasters provided the dramatists with the material for ridiculous but thoroughly recognizable scenes–acceptable entertainment in ancient Athens as in the modern day theatre.A number of short passages from these plays, naming various pots shown here, are quoted as captions to the pictures. Figured and unfigured pots, glazed and partly glazed vases, course and fine ware- all were created on the potters simple wheel turned by an apprentice . 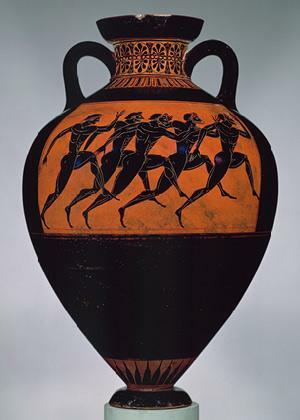 At the time these pots were made, Athens had the monopoly of the export trade in vases and we can imagine that, both at home and abroad people believed, as did Kritias the fifth-century philosopher that the Athenians ‘invented the potter’s wheel and the well renowned pottery. 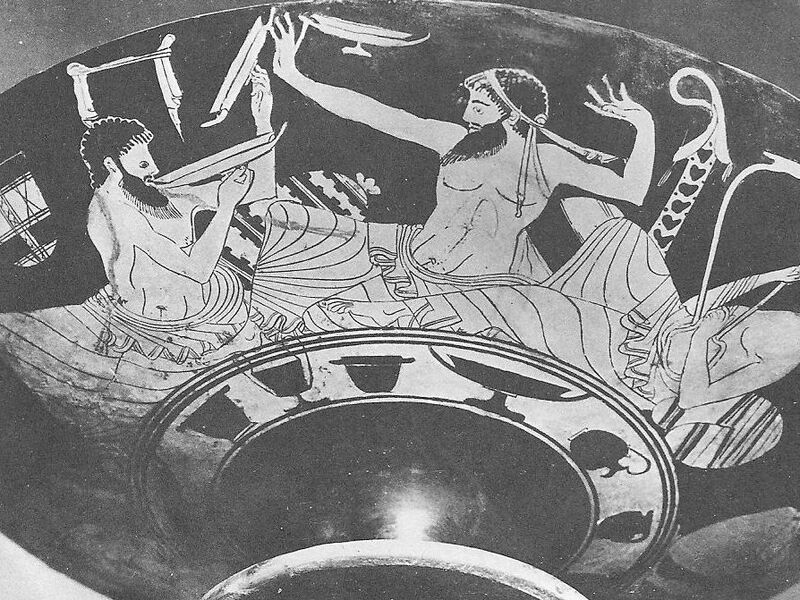 The Drinking Party Kylix in Rome – The painter of The Drinking Party shown on this Kylix emphasized the equipment needed for such an occasion by representing the vases in a row, beneath the picture itself. Water for the days needs is a primary concern in ancient Athens. 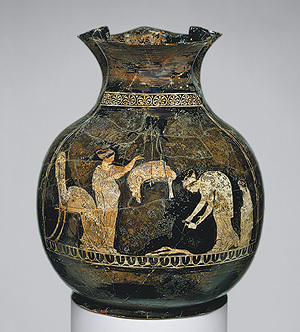 The vase painter turns the humdrum task of fetching water into one of the most delightful subjects of his repertory; scenes at the well are adapted in the circular field of a cup interior; a procession of girls toward the fountain house decorates the wall of the water jar itself. No house is complete without its well. The well-mouth, of terracotta, is sometimes shaped like the top of a pithoi, sometimes formed like a drum. 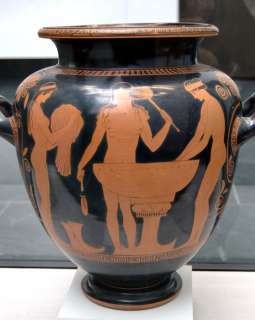 The jar most in use at the well is a kados (pail), either of metal or more usually of terracotta, a bail handle of rope may be fastened to the side handles. Girls at the fountain. Hydra in London. The girls have stilled their chattering at the artists bidding. The comic poet, however, presents the scene as one of noise and bustle evidence of the daily routine. Casseroles. Preparing the mid-day meal demands a selection from among the cooking pots available in the kitchen. Eels, or lamb stew perhaps, will simmer in a covered pot; if there is fish to be fried a large flat bottom pan will serve; soup will be boiled in a chytra (kettle) set over a fire or cooking stand pushed up to the edge of the large hearth. Frying pans and cooking pots. Women Washing – The alabastron with its perfumed oil is a welcome essential to the bath, whether a wash basin on a stand or a deep tub. A stick dipped in the alabastron serves to perfume the hair. soaping herself in the bath. 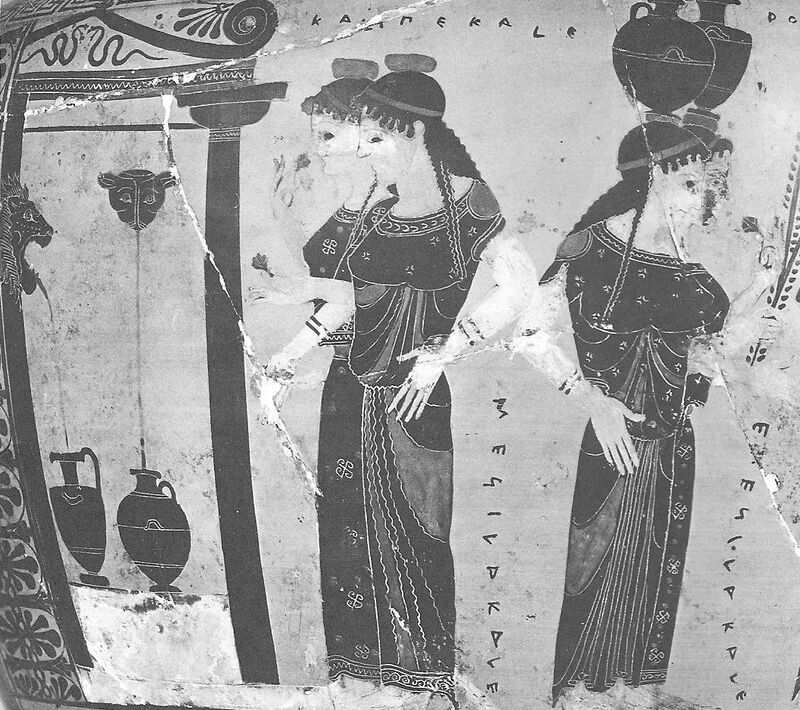 Aristophanes, The Lemnian Women. ca. 412 B.C. 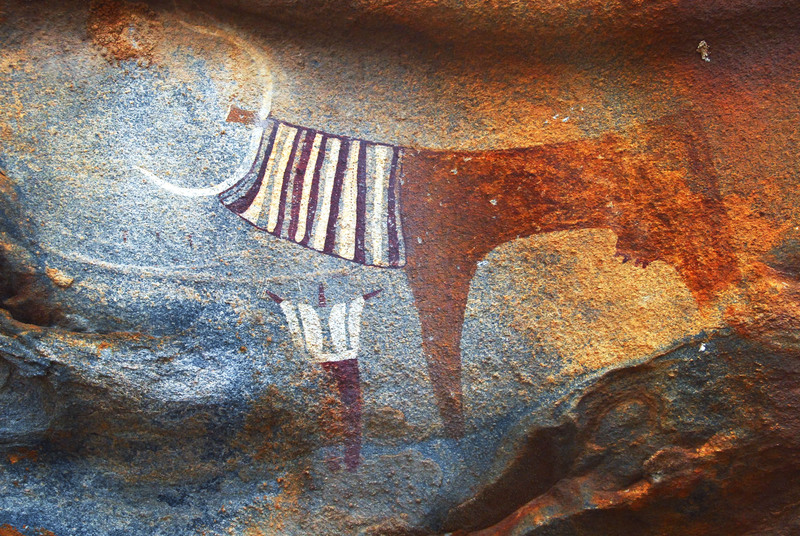 For those of you interested in Rock Art. Enjoy this post. Ten precious objects from the Wedgwood Collection | Culture24. As you all know I have posted articles about both Ancient and Antique pottery many times here on my blog, among which is the beautiful Wedgewood pottery. This is an appropriate update if any one wishes to go to see this collection. 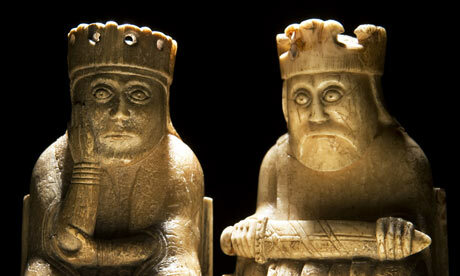 A Medieval chess-piece workshop discovered. 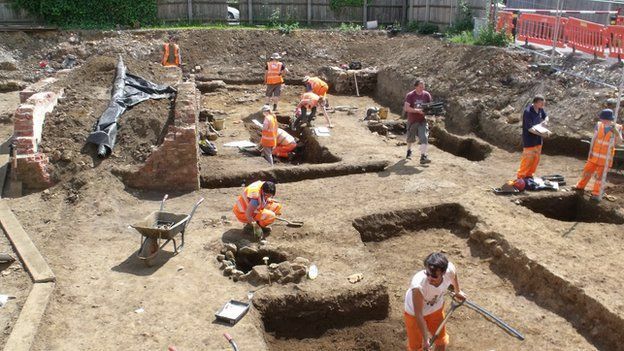 Archaeological work in Northampton Britain have uncovered traces of Britain’s first – known medieval workshop dedicated to making chess pieces. While exploring the remains of a late 12th century building within the former medieval town defences, archaeologists from MOLA Northampton found two gaming pieces carved from antler, interpreted as a king or queen and a bishop. Both were incomplete, having been discarded during manufacturing-but, Senior project manager Andy Chapman suggests, the discovery of large amounts of sawn offcuts from red and fallow deer antlers in the same deposits points to the presence of a nearby workshop producing pieces very much like these. Most of the dumped material lay near the postholes of a timber-framed building that could represent the workshop itself. If so, the structure would be the first such site to be identified in this country. The game of chess came to Europe from the East- through contact with the Arab world-and by the 12th century it was becoming a popular game at the upper levels of European society,’ said Andy. 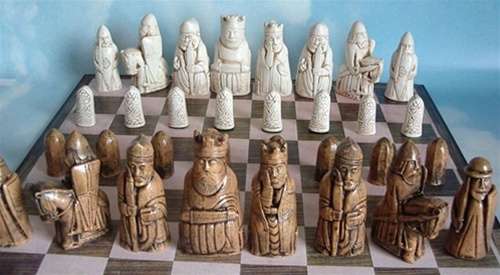 ” The finest pieces were elaborately decorated, fashioned in ivory and usually figurative , such as the famouse chessmen found on the Isle of Lewis, Scotland. To supply the wider market however, smaller pieces were made from antler of animal bone , often decorated with patterns of ring and dot motifs with incised lines encircling the base and running over the top. These simple chess pieces followed basic Arabian styles, where anthropomorphic designs were prohibited. But in Europe simple figurative elements such as heads, often with ring- and- dot eyes were added. Around 70 of these stylized pieces are known in Britain, mostly appearing individually as stray finds during excavations at high-status sites, such as castles , abbeys, rural manor houses or important town houses. The Northampton pieces are also decorated in this way. : one measuring about 2.5cm tall, roughly depicts a human head with a rudimentary face consisting of ring- and -dot eyes on either side of an angled nose. Its flat top had been cross-cut to form a simple crown, and the pieces tapering lower half would have been inserted into a larger cylindrical body to form a king or queen. As for why the piece was discarded, it seems that, while carving the right side of the face, the craftsman had accidentally exposed the antlers spongy core ,making it impossible to set a ring-and-dot eye in the correct place- although a misplaced eye, too low and to close to the nose., was added, perhaps in a failed attempt to salvage the piece. The other piece was carved as a taller cylindrical object some 4.2cm high, whose front had been cut to form a pair of simple rectangular heads- the classis design of a bishop, which in Europe was replaced the Arab vizier. One of the heads is broader than the other, however, perhaps because a sliver of antler broke away during manufacturing- which may explain why the piece was discarded. Chess pieces from Angel Street Northampton. Kings head left about l inch long and up to half an inch in diameter. Bishop on the right 1.6 inches long and l.1- l.2 inches in diameter. Although a medium-sized provincial town, Northampton was a major power at the time the chess pieces were being made. Its Royal castle hosted several parliaments between the mid 12th and late 14th centuries as well as the trial of Thomas Becket, Archbishop of Canterbury, in 1164. This prestigious context may have created a market for elite goods,such as chessmen, and could explain the flourishing of a local cottage industry to meet this demand. 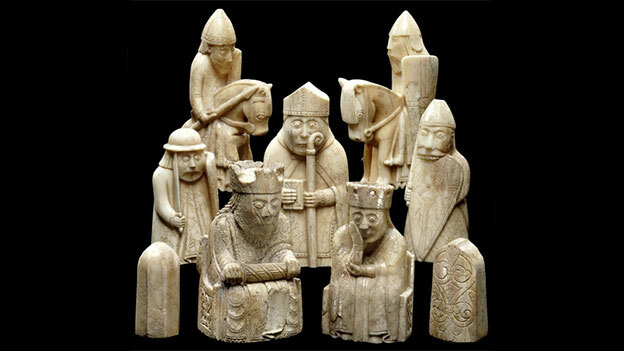 Here are some pictures of the famouse Isle of Lewis Chessmen. A Queen and King from part of the Medieval Lewis Chess sets. Lewis chess set on the board. The Archaeology News Network: Rediscovered papyri shed light on ancient Egypt.